Second Stage Theater was founded in 1979 to produce “second stagings” of contemporary American plays. They expanded this mission to produce new plays by their developing corps of writers. Over time, their productions have come to include solo performances, avant-garde theatrical events, new musicals, and world and New York premieres by American playwrights. In 1999, Second Stage Theater opened a new 296-seat theater at 43rd Street, designed by Dutch architect Rem Koolhaas. 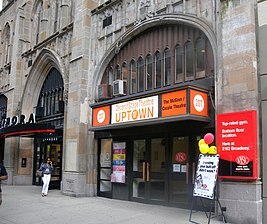 The Second Stage Theater Uptown series was inaugurated in 2002 to showcase the work of emerging artists at the McGinn/Cazale Theater at 76th Street. Second Stage supports both established and emerging artists with commissions and artist residencies focused on playwrights, directors, designers, and actors in the creation of contemporary work. 2ST UPTOWN launches young artists with full productions and developmental support and their Van Lier Fellowship program offers a training base for a future generation of directors. Second Stage is focused on developing not only artists but artistic community and builds future audiences by educating young people about the art of contemporary theater and encourages their participation in the cultural life of New York City. It was announced on April 18, 2015, that the sale of Helen Hayes Theater, a 597-seat Broadway theater located at 240 West 44th Street, to Second Stage had been completed. The sale price was $24.7 million. The first Second Stage production at The Hayes Theater will be Lobby Hero, by Kenneth Lonergan, starring Michael Cera and Chris Evans during the spring of 2018, after renovations and upgrades. Second Stage will become one of only four nonprofit theater companies that own and operate theaters on Broadway. 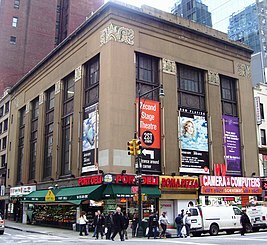 The company will continue to lease and operate its original theaters on the Upper West Side and in Midtown Manhattan. "2ST Uptown" was created in 2002 as a program to help develop and provide exposure for the voices of a new generation of theater artists. It has helped launch and advance the careers of several playwrights, including Lesyle Headland, Michael Mitnick, Roberto Aguirre-Sacasa, Adam Bock, Pulitzer Prize finalist Rajiv Joseph, and Dan O'Brien. Christopher Burney, Curator & Associate Artistic Director of Second Stage Theater, seeks to develop the skills of emerging playwrights, to provide early-career artists with the support of a major artistic institution, and to create new plays for the American Theater. Because of this, Second Stage serves as a gateway for many young American theater artists to step onto the New York scene. Each show has a limited rehearsal period, as well as a streamlined budget. Lead funding for Second Stage Uptown Series is provided by the Time Warner Foundation. All plays are presented at the McGinn/Cazale Theater. The company's more than 125 citations include six 2016 Tony Awards for "Dear Evan Hansen" including Best Musical, Best Book of a Musical (Steven Levenson), Best Original Score (Pasek & Paul), Best Performance by a Leading Actor in a Musical (Ben Platt), Best Performance by an Actress in a Featured Role in a Musical (Rachel Bay Jones), and Best Orchestrations (Alex Lacamoire), three 2009 Tony Awards for Next to Normal including Best Performance by a Leading Actress in a Musical (Alice Ripley), Best Original Score Written for the Theatre (Tom Kitt and Brian Yorkey), and Best Orchestrations (Tom Kitt and Michael Starobin), the 2007 Tony Award for Best Actress in a Play (Julie White) for The Little Dog Laughed, 2002 Tony Award for Best Director of a Play (Mary Zimmerman for Metamorphoses), the 2002 Lucille Lortel Award for Outstanding Body of Work, 28 Obie Awards including a 2017 Special Citation by the Obies for Anna Deavere Smith's Notes from the Field, seven Outer Critics Circle Awards, two Clarence Derwent Awards, 12 Drama Desk Awards, nine Theatre World Awards, 17 Lucille Lortel Awards, the Drama Critics Circle Award and 23 AUDELCO Awards. In 2010 Next to Normal received the Pulitzer Prize for Drama. In the following table, the seasons correspond to the year of the play's production; the ceremonies are traditionally held in the same or the following year as the production. Entries with a blue background have won the award; those with a white background are the nominees.